The North’s premier prog rock band, Mog & The Water Tribe, made a splash launching their new album with a special instore live show at one of the UK’s most renowned record shops. 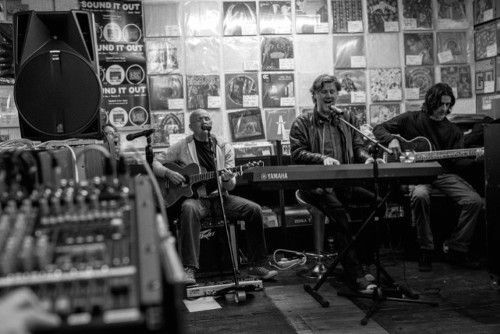 The Hartlepool band celebrated the release their new album, Astronaut Ghost, with a special live performance at Sound It Out records in Stockton-On-Tees, which gained national recognition after featuring in a documentary film about the shop. 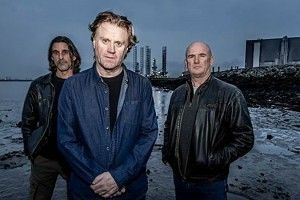 Astronaut Ghost is a excellent example of contemporary, progressive rock, which has been under going somewhat of a renaissance on the British music scene of late. And the four-piece group treated the packed record store to a stripped down, acoustic-based performance to the best songs from the album. Kicking off with the title track, singer Phil Swinburne was in fine voice, ably abetted by the harmonies of guitarist Lewis Richardson and backing vocalist Clair Jewson. Brilliant! – 10 top quality songs by a well-honed band from England’s north east, riding the gamut between modern melodic Prog, 80’s Rock/Pop and AOR! ‘Astronaut Ghost’ was written by composer / producer Phil Swinburne and represents personal observations inspired by his own experiences, covering topics such as communication, world affairs, death and the effects of the refugee crisis! The ten always melodic and brilliantly produced tracks on the album are a definite cross between modern Prog and 80's Pop/Rock or A.O.R. as some might call it. Lyrically, artistically and musically, this album is beautifully put together, and when I first heard it, several bouts of goose bump moments were created during the many hooks, choruses and keyboard solos. The album is of what we would call standard LP length and the quality of the songs is well maintained from start to finish, with no weak spots or “fillers” along the way. The vocals are excellent, the playing classy and the songs harmonically superb - To be honest there is nothing not to like about the entire record! Infectious and musically full of real substance you should think maybe: GENESIS or PENDRAGON meets CUTTING CREW or The MOTORS with a bit of CHINA CRISIS thrown in … it’s that sort of music … hang on, the songs are even strong enough to say maybe think: CROWDED HOUSE of even MIKE & THE MECHANICS … they were a perfect bridge between the genres type band as well! The band line-up is: Phil Swinburne (vocals / Keyboards), Lewis Richardson (guitars), Nige Spaven (bass) and Logi (drums / percussion). The CD comes with an 8-Page Full-Colour Booklet with lyrics and credits. North East Indie band Mog And The Water Tribe release their first album under their new guise moving on from being simply known as Mog. I must admit the new moniker seems a little more catchy and certainly adds to the intrigue behind the band. Mog And The Water Tribe consists of singer songwriter Phil Swinburne (vocals/keys) Lewis Richardson (guitars) K. Lodge (drums) and Nige Spaven (bass). Astronaut Ghost is a collection of ten songs of deeply spiritual and personal writing by Phil Swinburne and following numerous listening sessions i can confirm that Astronaut Ghost is a breath of fresh air amidst the banal fodder being generated by the likes of X-Factor wannabe’s and cover bands. The songs throughout this album are for the better part those that remain in your head and find yourself whistling or humming. The appeal of this album is the package as a whole and not the songs in isolation. A very lyrical set of songs telling stories, good old fashioned stuff that works admirably. Opening gambit The Water Tribe leaves the launch pad in a pacey pleasing way with guitar and keys racing along at break neck speed. A get at the elite in society who feel they can actually walk on water the song had me thinking of The Cure and their like. Lots of 80’s sounds and influence can be gleaned throughout the songs from China Crisis to Crowded House. In the light of recent events with air strikes in Syria and Iraq by UK forces songs like Not In My Name really do reflect a view held by many and has some great keyboard inflections to boot. Phil Swinburne’s voice has a very sixties sound to it and i find the Northern accent that creeps in momentarily rather homely as are the images of the bands industrial environment included in the CD booklet. The album is nicely packaged representative the bands personalities. The album does have a tendency to meander and weave in and out of different genre, something i found interesting and kept me listening to the whole album rather than individual songs. Emotional Refugee is a Genesis pastiche if ever i heard one. I thought of Trick Of The Tale as soon as i heard it and it made me smile. A song about love and peace and the thought of refugee’s being used as political pawns it is surprisingly uplifting considering. Piano player Steve Palmer was drafted in to add a rather quaint honky tonk piano further lifting the mood of the piece. The antithesis of this is Sunken. A darker and more bleak look at the inability to interact and the want to isolate ones self. Lewis Richardson’s guitar sounding very Simple Minds and like most of his guitar work here was subtle if slightly understated. Like many of the other songs on the album i did relate to them and found it easy to immerse myself in their message. Evident throughout is the punchy and solid bass laid down by Nige Spaven and bolsters a great soundstage present all the way through the album. Ghost is a missive based around belief and has some wicked subsonic keyboard sounds at the beginning. Many of the songs and their meanings i found intertwined and the following song The Voice a continuation of Ghost carrying a plea of wanting someone to contact you. The penultimate song Forgive Yourself is without doubt my favourite song on the album. Using glassy keyboard sound as if to promote light and harmony. A song of forgiveness, about carrying guilt and ignorance. Very thoughtful provoking and beautifully put together. I found this song sticking in my head which is a good sign for any piece of music. Continuing with the spacey, airy sounds Astronaut completes the album splendidly. Lush soundscapes and memorable licks make you want to play it all over again. I think you can tell that i like this album a lot. My first album review of 2016 and it sets the bar high. What comes across in spades is a band proud of their roots and heritage. Obvious from the start that this crafted well thought out pieces telling stories and conveying personal views and feelings. These are seasoned muso’s who learned their craft playing clubs and pubs and not the manufactured media driven products that abound today. I thoroughly recommend this album. It defies categorisation and as i said above is a breath of fresh air. Mog And The Water Tribe are no strangers to the art of song. They have been around in many guises since the mid seventies. Beginning as Trapps, Phil and guitarist Lewis Richardson earned their spurs in the pubs and clubs of the North East playing a mixture of originals and covers by the likes of Alice Cooper, Genesis and Todd Rundgren. The boys then pounded the North East club ciruit for a couple of years as the cover band 'The Strand' and became really popular in the North East of England and Yorkshire. After many musical adventures and collaborations, Phil and Lewis found themselves playing various events involving churches: ie Christenings, weddings and the like. This was short lived and following a joke about them being ‘men of God’ Lewis suggested the abbreviation as a name for their latest venture MOG. Phil's love of theatrics spurred him to record a rock operetta which was performed live in its entirety at the Progmeister Festival in March 2011. Since then Phil set up his own theatre company and in the ensuing years began to pen some rather personal songs. After recruiting Nige Spaven on bass, Phil and Lewis spent a year in the studio recording the new album Astronaut Ghost. Now under the moniker of Mog And The Water Tribe the trio find themselves at the top of their game and planning gigs to promote the album. Best described as AOR to Prog they excel at live performances finding themselves very much at home on stage with over thirty plus years of gigging behind them.